Phenix Technology was founded in 1972 by veteran firefighters Ronny Coleman, a former Chief of the San Clemente Fire Dept., and Ray Russell, a former Assistant Chief of the California State Fire Training Division. Phenix Technology was started with the goal of making safe helmets that had good balance, longevity, were light weight, comfortable, ergonomic, and could be used for all emergencies across various types of fire and emergency services. Now operating for nearly four decades, Phenix Technology has accumulated a wealth of design knowledge and is a recognized manufacturer and seller of high quality professional fire helmets built to NFPA industry standards. 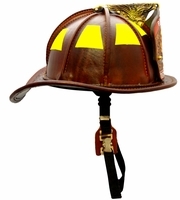 Phenix Technology�s fire helmets are used by thousands of firefighters in the United States and worldwide. Today Phenix Technology operates with a mission of producing quality products while staying committed to total customer satisfaction. All levels of the organization are involved in the process of meeting or exceeding customer requirements. Staying true to their history, the company continues to work towards continual improvements in helmet design while staying attentive to tradition and workmanship. In addition to its offerings in the fire fighting helmet arena, the company has also been expanding its product line to include various helmet accessories. Phenix Technology is an ISO certified company and operates out of its facility located in Riverside, California.